Berkley hit upon a recipe for success when they chose to combine novellas from four excellent and popular authors in this anthology. Callie Ann Cramer needs a groom in a hurry. Marriage will ensure that her husband is her next of kin and thwart her step-father’s plan to have Callie committed to an institution for the insane. He covets the ranch that he has worked since he married Callie’s mother, and there’s not much he is unwilling to do to achieve his goal. Callie has evaded his efforts to marry her off, survived attacks on her person, and found some measure of contentment living in a small house on the edge of the property. Her step-father has already been successful in persuading most of the town that eccentric Callie who prefers animals to people is crazy. Now that the woman he wants to marry refuses to love on a ranch with Crazy Callie, he has a new reason to get rid of his step-daughter. Lawyer Luke Morgan—dumped, broke, and drunk—looks like Callie’s best bet, but he proves to be a better bargain than Callie dared dream. Jodi Thomas is one of the best storytellers writing romance fiction, and in “Crazy Callie,” she takes one of the oldest tropes in the genre, the marriage of convenience, and gives it a fresh twist. The result is a story that blends humor, sweetness, and a sigh-worthy ending. Thomas is an expert at creating quirky characters that retain their credibility, and she does so again in this story. Even the villain is human. If you are a fan of Thomas’s Western novels, you will fully appreciate this one. Felicity Ravenwood left her groom at the altar and ran away in the private rail car her father had built for the couple’s wedding trip. Her father, a railroad tycoon, calls in a favor and sends Nat Church, an expert in repossession and recovery whose service is usually under the direct orders of the President of the United States, after his wayward daughter. Nat finds Felicity in a jail cell in Falls Hollow, Colorado, along with seventeen local temperance activists. Felicity has no intention of meekly accepting a return to her father, and refuses to leave the jail. But Nat is a man who knows how to ensure his success. The next thing Felicity knows she is in her private rail car in a leg iron, listening to Nat tell her that her father has cut off her funds but given her freedom to travel in the car so long as she never leaves it. Thus the two begin two journeys: a circuitous one in the luxurious car through thinly inhabited Western towns and an emotional one that ends in an HEA. Goodman’s story is my favorite. I too fell in love with Nat Church, who reminds me of a younger, sexier, more handsome version of Paladin in Have Gun—Will Travel, one of my early heroes. And Felicity’s independence and intelligence make her almost as delightful as Nat. The seduction scene is one of those perfect scenes that readers are lucky enough to be given sometimes. Readers of Goodman’s recent Western romances will recognize Nat Church as the fictional character in the dime novels referenced in those books. Richard Whitmeyer and Rachel James meet on a train shortly after a bank robber in Omaha City escaped with two hundred bearer bonds and a fortune in uncut jewels and left behind not a single clue as to his identity. Richard is an insurance investigator on track of the robber; Rachel is employed by a detective agency for the same task. Each holds his/her own identity close, and each is suspicious that the other knows something about the robbery. Warner adds a powerful attraction between these two strong-minded, intelligent people, the spice of danger, and some genuinely funny moments. I love Kaki Warner’s characters. I always find them fully dimensional with an extra dollop of wit and warmth. Richard and Rachel are just as appealing as the characters in Warner’s novels. The battle between attraction and suspicion is handled with great skill, and the interactions between the protagonists often left me smiling. Maeve Daugherty ran away from her life as a banker’s privileged daughter in New York City because of her parents’ interference in her efforts to make a difference in the poorest sections of the city. She joined her Uncle Mick on his journey to Texas, but Mick gambled away their funds and left Maeve in San Antonio with the advice that she seek employment as a housekeeper on nanny. Instead, she finds work as bookkeeper in a brothel. Zebulon Crow, her father’s bodyguard, comes after Maeve. She thinks he has been sent by her father. In reality, her father is far more concerned about Mick and money he has stolen from him. Finding Maeve is Zeb’s personal mission, but the two will have to survive danger and defeat dangerous enemies before they can claim their HEA. Kent’s story is the darkest in the group, and the most action-filled. It features degrees and varieties of villainy, class issues, a tortured hero, and an unconventional heroine. That’s a lot to pack in a novella, and it is a measure of Kent’s skill as a writer that she does so and makes them all work. Boots Under Her Bed is a rare anthology in which all the stories are entertaining with engaging characters. The voices and styles of the four authors are diverse, so there is never the sense of a story retold that plagues some collections. If you are a fan of any of these authors or if you just have a fondness for Western romance, I think you will agree that this book is a winner. This anthology is a must have for me. I love Jodi Thomas' stories. Jo Goodman and Kaki Warner are also favorites. Again, anthologies are a favorite of mine and I have several with Jodi Thomas as the lead author. Thanks for bringing another good book to my attention. This anthology is a must have for me. Me too. 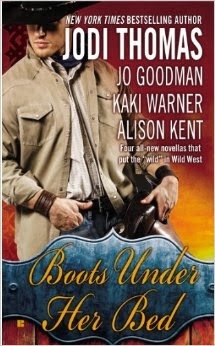 Thomas and Goodman are long-time favorites and Kaki Warner has been an auto-buy since I read her first book. Love her voice! I am so glad to hear that this one is good. I am really looking forward to it! Thanks, Janga! Thanks, Janga! This one is waiting for me on my Kindle. Now I'm even more excited to read it! I've read and enjoyed all 4 of these authors. Alison Kent and her SG5 series was a must read for me. Kaki Warner is the newest author. Jodi Thomas and Jo Goodman I've been following for a long time. Although I haven't read any of Ms Goodman's recent work. I do enjoy anthologies for quick, interesting reads especially to take along as I wait for appointments. I've read two of the four and enjoyed their stories. Anthologies are great for finding new authors and enjoying known authors. So a win-win situation. Thanks for the review. I agree, catslady. I've discovered some great authors through anthologies! All of these authors are great and I have read their work before. Would love to read this one. I'm hoping to start this one sometime this week. Hope you enjoy it, Quilt Lady! Hope you enjoy it, Donna!